When NASA launched New Horizons back in 2006, the spacecraft payload included your traditional of “scientific instruments” and “maneuvering thrusters”. But the engineers included a collection of nine secret items as well, including ashes from Pluto discoverer Clyde Tombaugh, and few other trinkets. 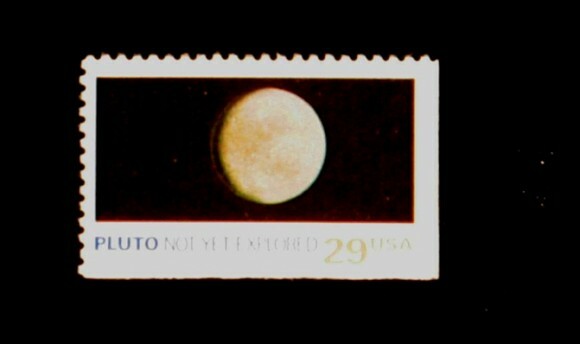 One noteworthy addition was a 1991 US postage stamp featuring “Pluto: Not Yet Explored”. And thus, New Horizons was carrying a symbol of its own scientific inquiry, an indication that even Pluto would get the exploration treatment when it made its closest flyby on July 13, 2015. To celebrate this exploration, the US Postal Service has announced a new series of Pluto stamps, with updated pictures of the dwarf planet and an artist’s illustration of New Horizons. There were a bunch of space stamps released this week, including ones celebrating Star Trek, new views of the planets, and global stamps for the Moon (send a letter anywhere on Earth, but not to the Moon, strangely). Gotta collect them all! Previous PostPrevious How Many Moons Does Mercury Have?